Mike Babcock joined the Wednesday Night Hockey broadcast on Sportsnet before the Toronto Maple Leafs vs. San Jose Sharks matchup, discussing the return of Auston Matthews, the Nazem Kadri vs. Joe Thornton rivalry, and Mitch Marner’s magical abilities. What do you expect from Auston Matthews in his first game back? Babcock: I expect him to be good. He’s had the type of injury where he’s been allowed to skate the whole time. He’s been out a long time and he’s worked hard at it. That doesn’t necessarily get you in game rhythm, but he’s excited to play and we’re excited to have him. What was he like in the time that he was off? You said that he was itching to get back and frustrated. What was he like to you? Babcock: Well, I mean, fine. To be honest with you, more of our skill people and our assistant coaches deal with him more because I’m dealing with the team. In saying that, in all of my conversations with him, it was evident at the end that enough was enough and he wanted to get going. But that’s part of being competitive and I thought he dug in hard and worked hard, and that’s going to show. If you don’t do the work, that shows, too. What did you learn about your team with Matthews out of the lineup? Babcock: I don’t know if you learn that much. I think we’ve got a pretty good team. We haven’t had Willy and Matty for a chunk of the season. I think it gives more guys opportunity. I thought initially when he got hurt, it took us a little bit. We won the game when he got hurt, went 2-0 down and came back and won. And then it took us a little bit to get going, and then we found a rhythm. We are going to have to find a rhythm with him back. There is no difference. Any time there are changes, you’ve got to get your rhythm back. 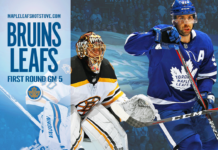 One of the sidebars for tonight’s game is Nazem Kadri vs. Joe Thornton and Nazem Kadri vs. the San Jose Sharks. They played him hard right off the opening faceoff last game. What do you expect this evening? Babcock: I think there is a lot of talk about nothing. Joe Thornton started the fight in here. Let’s make that clear. There are not often 190 pound guys chasing after 220 pound men. But Naz stood his ground. But in the last game, we basically said don’t get involved and let’s play the game. I thought it worked in our favour. Is it the same thing tonight? No conversations with Nazem Kadri, just play your game? Did you have a word with Kadri? Babcock: Didn’t even talk about it. Naz doesn’t get too wound up about stuff. Sometimes something like this will get him going even better, so I am excited for him. Mitch Marner — a lot of talk not just in Toronto but league wide that he is top five in the NHL in points. When you see Mitch Marner playing right now, what goes through your mind? 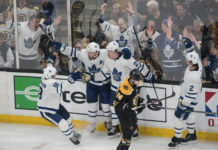 Babcock: I just think he is an elite player. But what I like about Mitch is that he knows about winning. It’s not about scoring. It’s about winning for him. He tracks harder than anybody. He can play without the puck. He can play center. He can play penalty kill. He can play on the power play. He makes the right decision most times. Like Morgan Rielly, he has unbelievable enthusiasm and energy for the game and it makes everyone around him better. It just seems as if whenever he has the puck, ice appears around him. Is that an optical illusion or what is he doing specifically to open gaps on defensemen? Babcock: There is no question about it. I thought when Pastrnak was in here the other night, we saw the same thing. No one else has any time in the game. There is no time and there is no space. But when those guys get it, it seems like everyone just backs up. Obviously, it’s edges, brain, the ability to create space. It’s called talent. They are fortunate to have it. It is a talented team you are facing tonight. If you are successful tonight, what will you have done well? Babcock: We’ve got to take care of the puck for sure. We’ve got to get in on that D. That D, when they’re standing on the offensive blue line, can be real dangerous. They’re a good cycle team. They forecheck real well; one of the top forechecking teams in the league. They don’t give up their line. We are going to have to get on them. We’ve got to grind. We’ve got to spend some time in the offensive zone rolling around.